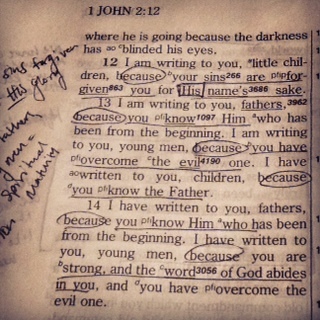 In 1 John 2:12-14, John wrote to the church and addressed them according to their level of spiritual maturity. He called these believers little children, fathers, and young men. I think it’s important to reflect where one stands in their level of spiritual maturity. Are we as babes, not knowing much else but rejoicing in the fact that “[Our] sins are forgiven [us] for His name’s sake”? (v. 12). This is not an erroneous place to be; we’ve all been there. And in fact, we should rejoice in this state, because we have come to the realization of how bad our sin really is, and how great the forgiveness is that we have received and so undoubtedly didn’t deserve. At this stage, we are so overcome with thankfulness that God has and will always love us beyond what we can comprehend. It’s not because of anything we did or can do; it’s simply for “His name’s sake.” In other words, His forgiveness is granted to us simply because of Him, through Him, and all for His glory. Next, John address the “fathers” in their spiritual walk. He states, “I am writing to you, fathers, because you know Him who has been from the beginning” (v. 13). These are believers, men and women, who have a deep, long spiritual standing. The kind of relationship with Christ that isn’t just established overnight but through years of intimate fellowship with our Lord. They “know” Him, not only in an intellectual way, but more so in the depth of companionship with Jesus. We may know about somebody, yet it’s when we spend countless hours and much of our life with that person that we truly begin to know them. Though all of these stages are incredible and necessary, being one of the “young men” that John addresses must be the most invigorating and the most challenging. These are the believers that are no longer little children and not yet fathers. “I am writing to you, young men, because you have overcome the evil one” (v. 13). He also explains that he is writing to the young men because they are strong, and the word of God abides in them (v. 14). This stage of spiritual maturity calls for the believer to be in the “front-lines” of God’s work. They have “overcome the evil one.” We would not send out our little children to war, nor our old men to the front lines. The most effort, the greatest cost, and the superior strength is expected of the young men. Or the men and women of a mature faith that are willing to go to battle for Christ and the advancement of His kingdom. How amazing is that? God considers these young men and women of faith as strong, because the Word of God abides, or lives, in them. We have the ability to overcome the evil one because of this strength, because the truth of His Word, and because He is with us. Why would we not want to be in the front lines? God has called us to such a time as this, where the world truly needs these strong people of faith to walk in the power of the Holy Spirit to share the gospel with a dying generation. Yes, there will be spiritual warfare. But are you willing to accept the challenge? To step out from being a little child, to a young man or woman?